Ike’s thoughtful direction brings out the play’s idiosyncratic charms. She mines Suh’s script for all of its humor, while challenging our expectations of who these historical characters may or may not have been. 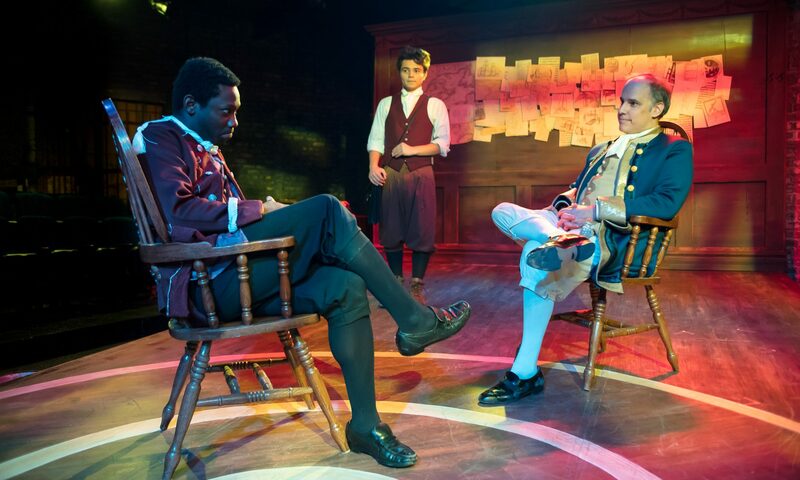 The play opens on the famous storm during which Franklin conducted his key on the kite experiment. Ben (Tom Hickey) describes to William (Kai Ealy) the intoxicating thrill he gets from pulling lightning from the sky. Indeed, thrill-seeking seems to be at the core of all Ben’s pursuits. As a scientist he loves to discover but most of all what Ben loves is to influence. His desire to influence nature parallels his desire to influence people and politics. The stakes escalate as the revolution looms. Ben drags William to England to lobby King George III, who installs him William as Governor of New Jersey. William finds himself at odds not just with his father but with the revolutionary cause. Tom Hickey is mesmerizing as Ben whom he plays as a boundlessly charismatic narcissist. Ben is constantly congratulating himself for founding academies or conceptualizing new medical devices and happily takes most of the credit for “inventing” the United States of America. Ben is also powerfully aware of his status as living legend, continually invoking his own name as in “I’m Ben Franklin.” It’s obnoxious, but also we have to give props, the man is by all accounts extraordinary. A lot of what makes this play so riotously funny is the playwright’s commentary on the origins of our American notions of exceptionalism. Kai Ealy’s William is immediately sympathetic. We bristle with him when his father is insulting and cheer when he stands up for himself. As the play progresses we watch William’s heart break and then harden. His father mocks all his decisions and seems to delight in watching him suffer. In one of the funniest scenes in the play, the two finally tussle in a hilarious fight scene where the ridiculousness of trying to oppose a father who seems to be a force of nature in his own right becomes comically apparent. The set (Milo Bue) cleverly reinforces the emotional atmosphere for the play. Father and son are trapped together on a long, narrow alley stage, almost an island. There’s no escape for William from his emotionally needy father who makes sport of insulting and belittling him, all the while betraying how desperate he is for his son’s companionship. Suh uses contemporary vernacular to draw parallels between late 18th century Americans and todays. Ben’s speech and attitude are reminiscent of an aging sixties radical who extols the merits of free love and relishes in flaunting authority; William stews like a disaffected a gen-xer. It isn’t until late in the play we get to see Ben as vulnerable, in one of his few introspective moments he doubts his greatness as a scientist and finally shows a flash of insight into his limitations. But dwelling on limitations isn’t what America, or Ben is really about and once the wind starts to blow in his direction he’s back to his old self. In the play’s final moments a third character is introduced. Ben’s own son, Temple (Nik Kmiecik) and the play comes full circle to a poetic and deeply satisfying conclusion. In one memorable speech Ben fantasizes about his new nation romantically declaring America will do both great and terrible things. Likewise Suh has written a play that effectively dramatizes and critiques many things, both great and terrible, about our nation’s founding myths.